The head of the Catholic Church in Ireland has appealed to politicians in Ireland and Britain to stop talking at each other and work together with just eight weeks to go before Britain exits the EU on 29 March 2019. In an interview with iCatholic, Archbishop Eamon Martin of Armagh warned that border communities in Ireland are “anxious” about what might happen and “fearful for their livelihoods”. 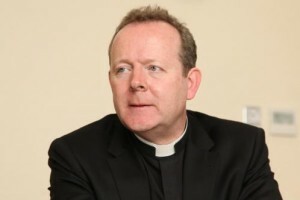 The Archbishop also referred to comments made by the Taoiseach in an interview with Bloomberg Television during the World Economic Forum in Davos, in which Mr Varadkar said that in a no-deal scenario, a hard border “would involve customs posts, it would involve people in uniform and it may involve the need, for example, for cameras, physical infrastructure, possibly a police presence or army presence to back it up”. The Primate said the Taoiseach was “painting a picture of the doomsday scenario”. Archbishop Martin, whose diocese straddles the border, said there were communities along the border who are very uncertain at this time. He noted how a demonstration along the border was held at the weekend in his own diocese to highlight that border communities are anxious about what might happen. Referring to the tens of thousands of people who cross the border between Northern Ireland and the Republic in order to go about their daily work, he stressed that a hard border would impact on freedom of movement but also on tourism. “I would ask this question: we are only seven or eight weeks from the proposed date of exit. I wonder are we really thinking enough about the impact on people on the ground? Referring to the car bombing in his home city of Derry last weekend he said, “That horrific bombing – which was so near to being a terrible catastrophe – so near to the loss of life, reminds us of where we have come from. But in Northern Ireland itself, the impasse at Stormont had left Northern Ireland without an Assembly for more than two years. He stressed that borders can be created in people’s minds and hearts and he appealed to all to seek to build bridges not barriers. He said political leaders need to help people unpack words like “backstop” and “hard border” that had become “part of the jargon of this whole debate”.